Do you accept that Muslims are involved in famous incident of terrorism 9/11? if this is truth then look back at the news papers of 2001. All the pilots who hit the aero planes with Pentagon and New York were Arabic. According to American research institutes few Arabic youth took regular training of flying after planning for terrorism (they were trained within America and American security agencies were ignorant of it?). Most of these pilots were from Saudi Arabia and rest from Egypt. They all were the children of highly educated and rich families. Then why did America attack Afghanistan, when no afghan hass participated in this incident of terrorism? But some American intellectuals blamed Osama Bin Laden (without any proof) who is hiding in Afghanistan for financial help of terrorists. This was rejected by Osama. But American attacked Afghanistan aggressively and destroyed whole country. At that time even the American media was astonished and said that blaming Muslims for terrorism is without any proof and a lie. In order to provide support to its aggressiveness America started using terminologies of �Islamic extremism� and �Talibanaization�. But the real purpose behind this attack wasn�t to arrest Osama or end govt. of Talibans. Actually the real purpose was to occupy the mineral wealth of central Asian states and control the routes for the transportation to the world. And now the incidents after 9/11 in the eight has proved that incident of terrorism was the part of planning to control routes to central Asian states and their mineral wealth, which has set the whole area to the fire. At that time Pak-army is fighting in tribal areas against Taliban or so called Talibanaization. Except navy all departments of armed forces are being utilized in this war. In the whole country there is "security high alert" against any act of terrorism. When will this war ends is unpredictable. However it started in June 2002 when first bullet was fired on security forces in order to stop the development on Gawadar port, in the name of undeveloped Baloch nation in Balochistan. In the 2005 when the development work on Gawadar port was completed the tension in Balochistan was on the peak. Dozens of Chinese engineers working on port were murdered or wounded. Situation was so much unstable that the chief guest Chinese Premier for the inauguration of port went back from Islamabad coz Chinese intelligence agencies doesn�t allow him to go to Gawadar. But our media and analysts weren�t ready to tell that truth to the nation. The cause of tense situation in Balochistan is development of Gawadar by Chinese. Coz USA, India including some Muslim countries aren�t happy on this development. Perhaps that bad situation has been restricted to Balochistan but Phase II of Karakorum highway brought it to NWFP. The fight in the name of Islam started in Bajor, Malakand, and Swat when in 2004 China signed an agreement with govt. of Pakistan for extension of historical highway between Gilgat to Swat passing through Dir, Chitral. That highway was named as Karakorum Highway phase II. 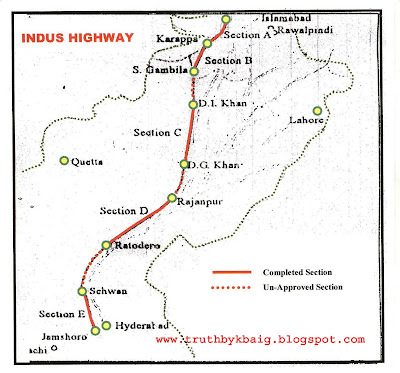 According to historical books that highway was built approximately 5000 years ago between central Asian states and China passing through Khyber pass Peshawar. As soon as some parts of that plan were brought in front of world, siren was felt in some capitals of countries. USA took it as a threat to her plans and India feels this plan a threat to her integrity. Near located countries also came in scope of this trade route from Gawadar to Sinkiang (Tashghur). On the other hand after starting the work on Gawadar China started laying railway line from Shanghai to Sinkiang (Tashghur). That plan of railway line which completed in 2008 is also as unique as Great Wall of China. In order to keep China away from Gawadar and stop Pakistan from availing economic benefits the war of deprived Baloch's (which is still continued) has been very successful. However same policy wasn�t adoptable in NWFP or tribal areas. So keeping in view the love in those people for Islam propaganda was launched i.e. 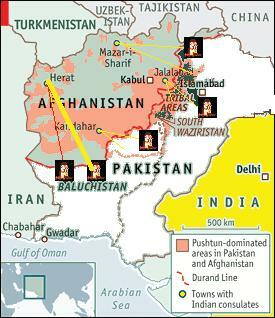 Osama or main leadership of Alqaeda is present in those areas. And these areas are claimed to be threat to West. British and US media has been already propagating that Talibans hide in these areas and launch attacks to US and NETTO Forces and return back to these areas. After wards afghan president Hamid Karzai also started blaming tribal areas for interference, he even blamed ISI and Pak-Army for financial support to Taliban to fight against allied forces. When this didn�t have any effect American generals, foreign minister and Head of CIA also expressed concern about support of Pak Army to Taliban. Mutual benefits of some countries encouraged India to utilize its old relationships with northern alliance within Afghanistan to halt development of Gawadar port and fail the trade route to China. USA had purpose just to stop China from reaching to Gawadar port but India in the support of US wishes is trying to make Pakistan weak, so that it can fulfill its dream of occupying Pakistan. In Afghanistan many offices were opened for job seekers. The purpose of these offices was to recruit jobless youth of Pakistani tribal areas and send them to India for the training camps of terrorism in India. Tribal youth was deceived that they are somewhere within Afghanistan. In these training camps they are first of all brain washed, then trained for terrorist acts, gorilla warfare and sent back to Pakistan. In this regard Indian agency RAW is being helped by Israel and MOSAD. In this way the Indian embassy and its sub offices present within the Afghanistan were converted to military operational headquarters against Pakistan. The propaganda against �Islam� and �Islamic extremism� had already worried the world. The attacks of terrorists in Pakistan in the name of �Islamic extremism� especially suicide attacks made world intelligentsia worry about nuclear weapons of Pakistan. Terrorists attacked specially army buildings and armed personnel. Suicide bombers use to appear from somewhere and target ISI, Air force employees, or army men. Camps of Pak army are attacked in the dark of night and after killing all the soldiers their dead bodies are mitigated. Pak army restrained from reaction so that innocent people aren�t killed. In this way Pak army has to bear two types of attacks. Within the country the army is being attacked on cantonments and in tribal areas it has to fight against gorilla war. While our so called analysts of media, are regarding it as a Pathan�s revenge and reaction of deployment of army in tribal areas. Actually reality is against it. In tribal areas not only the trained agents of India and Afghanistan are fighting against army but regular army of both countries is fighting as well. This is fully supported by US. In fact if Pak army hasn�t been sent to these areas the situation has much worsened from present situation with which Pak army and people of these areas are fighting. Pak army and govt. wasted much time in deals with these militants� leaders but the purpose of these militants is neither peace nor applying of Islamic Law. 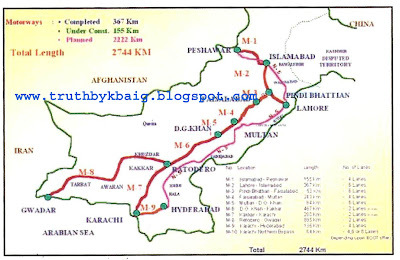 The final plan of Motorway which is yet sompleted only to M1, M2, and M3. However in Multan on M4 the construction work is about to start. While in the name of Coastal Highway China has already constructed M8. Let�s now discuss another aspect of this topic, which is in the knowledge of few readers. India signed a deal with Iran in 2003 to develop an Irani port (Cha Bahar) near Gawadar. Which was funded by Iran and development work to be done by Indian engineers. Afterwards that port was connected to a ring road built by US in Afghanistan at the point of Delaram via a highway. Near Iran�s border Afghan city Zarang to Delaram 500 km long two way road was built by India as an aid to iran. It is known as highway one, or �zarangdelaram road� as well. Also many parts from Cha Bahar port to Zarang were also built by Indian engineers. 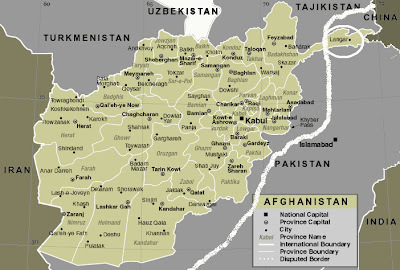 While the American ring road is connected in west to Kandhar, after passing through Lashkar gah, Delaram, farh-o-farhaat to the north in Qila-e-no and in east to Kabul. On the other side this road reaches Kabul via Gazni. That ring road is also connected to roads coming from Turkmenistan, Uzbekistan, and Tajikistan. In last ten years US has spent billions of dollars to built bridges on narrow mountain paths, passes and tunnels. Investment made by Japan and India is another issue. But fighting for freedom Afghans have destroyed all of these. Allies have been unable to defend these bridges with all their latest weapons. At that time ring road and Indian built zarangdelaram road has been changed to murder place for the passengers. 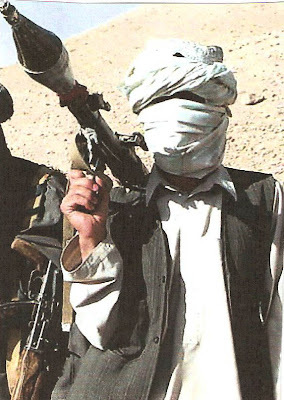 According to American research institutes there are 35 well equipped Afghan armed groups who have one purpose, i.e. to destroy bridges and roads, murder passengers traveling on these roads especially those supporting Allies, and ambushing the convoys of allied armed forces. Due to this it has been impossible for allies to move without air support. American and Indian blame China which has ruined all of the plans of trade in Afghanistan by India and America. Afghan police or army isn�t ready to come to near to these deadly roads. These are the reasons for which US has changed Command in Afghanistan. US has already decided to increase army. Although Obama govt. has already made offer to China to mutually benefit from Karakorum phase II via Indus Highway to Gawadar but the condition is that this trade route doesn�t enter to China from Pakistan but from Tajikistan. Look at the history, wherever America went (for its fake interest), destruction became the fate of that area. The collection of states named as �USA� having attitude like a cowboy and to attain its purpose killing human beings mercilessly, has destroyed many countries and killed millions of human beings in the name of friendship with it. Except Israel say the name of any country where America has done anything for development or goodness of human beings. But don�t know why every second country of world is willing to be freind of USA? And in how many countries the history of Japan, Vietnam, Afghanistan and Iraq will be repeated. Allah knows that better. Opposing this phenomenon China has neither occupied any country for its social, geographical or political benefits nor broke the trust of its friendly countries. No matter china's ally becomes fried of America or any other power. China isn�t concerned with it. Although American following analysts often use to say that china is a threat to American economy and china�s policies are threat to America�s being super power of world. But china has never shown willingness to be a superpower and nor it has done any such planning of armed or defense nature which shows china wants to be a superpower. Either they are agreements of exploring oil in Kenya n Nigeria or searching for natural gas in Burma (Myanmar) in all these countries China has always respected freedom n benefits of them. Look at the Pak-China friendship which is more than half century old. China has always helped Pakistan in every hour of need and for the friendship China always stood with Pakistani people inspire of Ruling riches. Although our leaders are willing to be American slaves but you�ll never see any worriedness from Chinese leaders. Development on Gawadar port is proof of this friendship. That China built up the port with its own finances in order to gain access to warm waters without any conditions in a record little time of 2.5 years. And gave this Port in the control of Pakistan. This neither could be done by Soviet Union nor dared America to build up that port. But these countries not only put the integrity of Pakistan to danger for their trade benefits but also made the whole area into a hell. China has not only built port but also built many parts of roads to access it like Indus highway and Coastal highway. The aid for Kohat �friendship tunnel� by Japan is also the result Chinese struggle. Which has been tried to be destroyed two times by enemies Pakistan propagating themselves as Taliban. 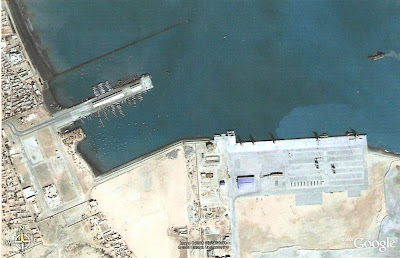 Natural Deep Sea port of Gawadar and the picture taken by satellite of world's 2nd largest port. Which is a proof that Pakistan is going to be the trade route of natural resources of Central Asian States. It doesn�t mean that China has no interest in Gawadar port or trade route. Like America, India, and Europe China also needs energy in order to continue its journey of development. In the form of energy that natural wealth is present in central Asian states. This is impossible to be transferred to outer world without access to warm waters. And Gawadar�s natural port in deep sea is the best suitable point for its trade. And that is the central point of the war being fought in our tribal areas, Dir and Swat. I.e. Soviet Union got disintegrated in the wish to get Gawadar. America is still entangled in Afghanistan after spending billions of dollars. Thousands of its soldiers have been killed. Its economy is collapsing, While China is about to reach Gawadar just by spending two billions and without taking any loss. Afghanistan keeps burning, central Asian state�s mineral wealth is left buried in earth, but China isn�t concerned about it. From Gawadar to Kashghar trade route China gets only fuel is enough for China. It will make China to complete its journey of development in spite of twenty five years just in five years. 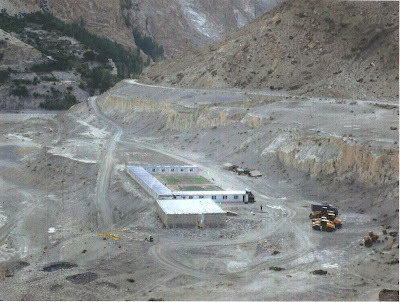 Keeping this need in mind, China asked permission to leave the present route of Karakorum highway and built it from Gilgat to the upper north-eastwards, via Chitral, Dir and valley of Swat to Kohat where this new road will be connected to Indus highway. After passing through Kohat tunnel that route will pass through Tank, Dera Ismail Khan, Taunsa, Dera Ghazi Khan, Rajan Pur, Kashmore, Shikarpur and join M-6 at Rato dero. From to there that route M-8 will be joined to Coastal highway via Khuzdar. The uniqueness of that trade is that there is no river in it, which needs a bridgwe. Readers this is an agreement between two sovereign states for mutual development. It isn�t a hidden deal or a plan against world which results in restlessness and now the situation has been worsened to war. China will not use this trade route for free. The taxes which will be gained from this trade route will be sufficient enough that Pakistan govt. will not need to charge its people for taxes and surcharges for ten years. In this way Pakistan will get into the row of developed countries. And China also wants to lay railway track on the proposed trade route. Then how can be our enemy Indian Brahman willing to engulf Pakistan and other world powers that are full of lust for mineral wealth of central Asian states will stay inert and silent. Will they like that nuclear country Pakistan gets economically independent? China also gets full benefit and they just see the whole scene? Lo� as Pakistan army has launched operation against terrorists, propaganda against insecurity of our nuclear assets have been started. If still you name these militants as Taliban and Muslims who are hitting Pakistan�s sovereignty, suicide bombers, mutilating dead bodies, cutting necks of opposers, killing innocent children and disrespecting humanity, then it is up to you. Curse of God, more then Muslims, acting upon the rules of Islam many Pak-Army soldiers and officers are killed in the name of Islam in last years. However we used to right these militants as Taliban inspite of all these facts. While America is itself creator of Taliban supporting them to spread to the whole trade route to central Asian states. Which included 2/3rd of Soviet minded soldiers and afghanis relating to KHALQ-O-PARCHAM parties. In which the govt. 's Minister of defence General Shah Nawaz Tani was on the top of list. Here we doesn�t want to repeat history of Taliban, but whether General Tani should be written and read as Taliban? In 1994 Naming a self-made group of militants as Taliban in order to protect its interests is based upon the American policy to defame Islam. In this way now making them fight with Pakistan army it is struggle to deceive the world. In 1994 the problem was of trade route and now it is also the same quarrel. The Gawadar port intensified the �Talibanaization� (struggle to stop trade via Pakistan). Will this problem go on like that? Tribal and border areas of Pakistan will continue to be a war zone? Arrests of Afghan citizens in Swat are the proof that the persons playing this game of bloodshed in peaceful cities of Pakistan are controlling the resistance against Pak-army from Afghanistan. They are being provided with ammunition, weapons, trained manpower etc. it is clear that America and its allies are acting upon the policy of neither we�ll do it nor let others do it in their pessimism. All the American investment in Afghanistan is useless. Trade through Iran�s port Chahar bagh is also conditioned to the peace in Afghanistan. Which can�t be seen in near future. Coz the restlessness and war in Afghanistan has become source of income for many. The coz of this is also American policies. This has made Afghanistan a heaven of drug mafia and smugglers of weapons. 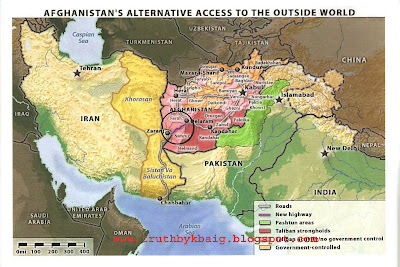 The heads of them aren�t only afghan war lords but also within American and NETTO forces. This situation has made hopeless all those countries that are willing to benefit from trade and trade route to central Asian states. The result is to be beard by people of Pakistan and province of NWFP. The only way to tackle is not to wait for peace in Afghanistan but to search new trade routes for fulfilling needs of energy and trade.